ROYAL CANIN Savour Exigent Dry Adult Cat Food is both scrummy and nutritious! Some cats have fussy appetites and might refuse to eat the food you give them. However, this behaviour is not an inherent trait in cats and can therefore be rectified by selecting food that not only contains healthy nutrients, but that also appeals to your cat’s particular appetite. Some cats that exhibit signs of fussiness are attracted by diversity in the food bowl. To stimulate your cat’s natural preference, Savour Exigent contains two synergistic types of kibbles, each with a different formula and texture to enhance dual savour sensation in even the fussiest of cats. What’s more, the specifically adapted energy content in ROYAL CANIN Savour Exigent helps to maintain the ideal bodyweight of an adult cat like yours. 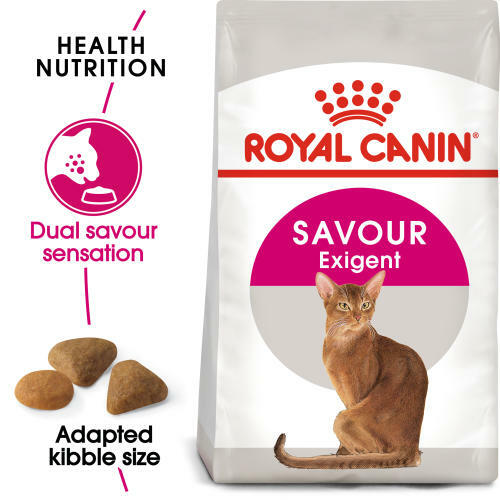 Suitable for both indoor and outdoor cats, ROYAL CANIN Savour Exigent will continue to stimulate your cat’s appetite and provide it with all the nutrients it needs to remain active and healthy. Some fussy cats are most attracted by diversity in the bowl. SAVOUR EXIGENT contains 2 different kibbles, each of a different formula and texture, to help stimulate the natural preference of these cats. Adapted energy content to help maintain the fussy cat at ideal weight. Each cat has a natural preference when selecting food: smell, texture or by protein level. ROYAL CANIN has developed 3 different formulas with the aim to satisfy even the fussiest cats. Formulated to help maintain health of an adult cat’s urinary system.